Plenty of squashing, pumping, romping, stomping action to be had! 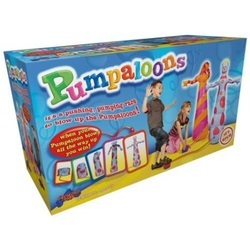 The aim of the hugely interactive Pumpaloons game is to blow up Stripeyloon and Spottyloon...and the first competitor to make their Pumpyloon stand up straight - wins! Like this top Christmas toy? Then you'll love Moon Dough Barn too!